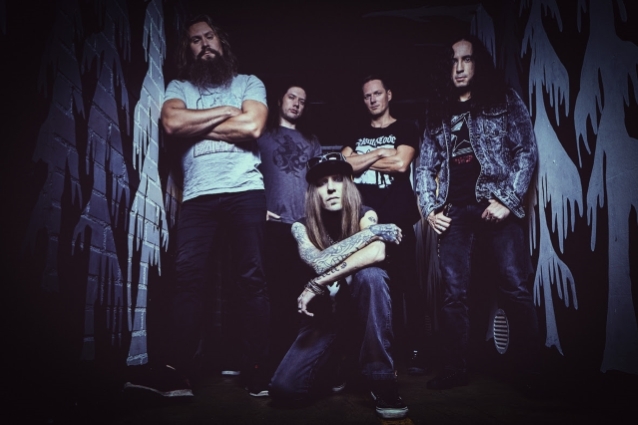 During a recent appearance on the "Iron City Rocks" podcast, CHILDREN OF BODOM frontman Alexi Laiho was asked how he has managed to keep his scratchy singing style going for more than two decades, seemingly without ever doing serious damage his vocal cords. He responded: "I think I just accidentally discovered some sort of technique way back in the day that I just don't lose my voice. It's been, like, 20 years. "It's funny you should ask, actually, 'cause I have had zero problems — probably the last time I lost my voice was in the '90s," he continued. "But on this [most recent North American] tour, I've actually had trouble with my throat, and it's been very unsettling, 'cause I don't know what's the deal with it, 'cause I never have a problem with it. But it's actually getting better now. "I think the thing was that we had a long break — it was a three-month break before this tour — so maybe my throat was just, like, 'What the hell is going on? '," he explained. Pressed about what he thinks other vocalists do wrong when trying to sing like him, Alexi said: "You're not supposed to do it from your throat. When you're going for that raspy sound, you're not supposed to use the throat — you're supposed to use your stomach. And I know that sounds weird, and it's impossible to explain, but, basically, stomach diaphragm, that's where it's coming from, and you're supposed to keep your throat open as opposed to trying to kind of close it to make that scratchy, raspy sound. And that's something I was doing during the first two albums, and I kept losing my voice. And after that, when I had been touring enough, I was sort of forced to come up with something else, and that's when I came up with the right technique." CHILDREN OF BODOM's latest album, "Hexed", was released March 8 via Nuclear Blast Records. The disc saw the return to Finland's Danger Johnny Studios where COB was reunited with Mikko Karmila ("I Worship Chaos", "Halo Of Blood", "Hatebreeder", "Follow The Reaper" and "Hate Crew Deathroll") who recorded everything except keyboards and also produced the album with the band. Janne Wirman recorded keyboards at Beyond Abilities Studios. The album was mixed and mastered at Finnvox Studios in Helsinki, Finland.